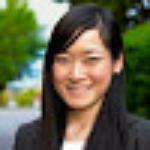 Susan was born and raised in Vancouver, Canada and has also lived in Victoria, Hong Kong, Taiwan and Austria. She has a background in international business and fascinated by new cultures and languages. 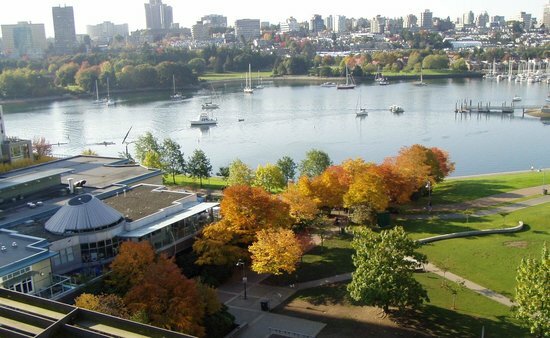 Vancouver is known for its scenic outdoors, urban lifestyle, fresh air and beautiful landscape. Whether you're an outdoor enthusiast or a city dweller, there's always something for you to do. The following are a few ideas for you to get the most out of your short stay in this beautiful city. Pack a small umbrella with you wherever you go. With the exception of July and August, it rains most of the year in Vancouver. Bring two pieces of identification with you if you plan to go to a bar or restaurant for an alcoholic drink. Looking for lunch or dinner plans? Be sure to have sushi while you're in Vancouver. Vancouver is known for its fresh, delicious and inexpensive sushi dishes. Be sure to try Vancouver's food trucks. The food trucks are mostly situated in downtown and offer a variety of choices. Japanese, Mexican, Canadian — you name it! A tip of at least 15% is recommend for restaurants and at bars. You are also encouraged to tip for taxi rides. Vancouver's buses only take exact change, so carry plenty of Canadian coins with you. Single bus fares are valid for travel within Vancouver for 90 minutes. For trips to the suburbs from Vancouver, different fares apply depending on whether you're traveling across two or three zones. 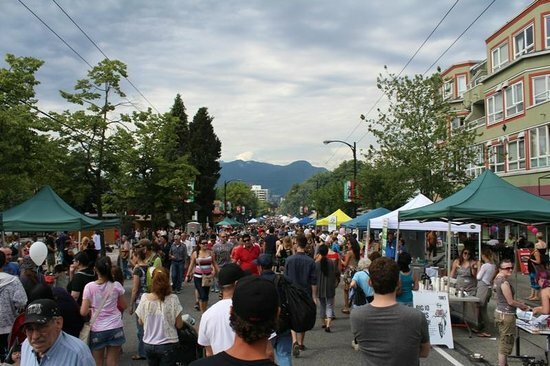 Be sure to check out the street festivals while you're in Vancouver. A few of the key festivals include Car Free Day (June), Vancouver Dyke March (August) and The Parade of the Lost Souls (October). 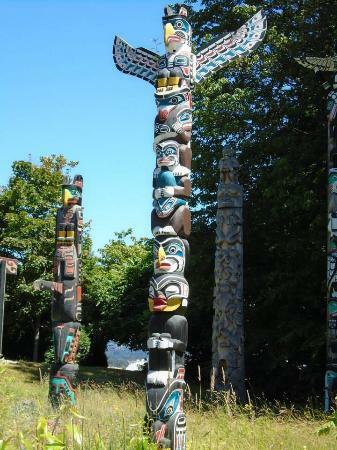 Stanley Park is a must-see for visitors of all ages, being one of Vancouver's largest and most popular attractions. With so many activities on offer, ranging from beautiful west coast beaches to Canada's largest aquarium, plan to spend at least three hours here. The park is easy to get to by bus. 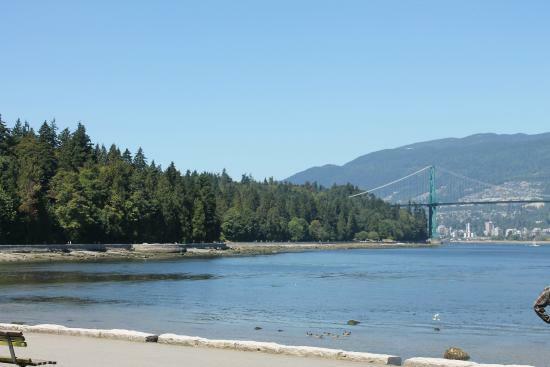 The #19 Stanley Park bus will take you directly there. If you are already in downtown, you can also take the #5 or #6 bus, which will take you to the entrance of the park on Denman and Davie. An easy way to get around the park is to rent a bike for a few hours from one of the bike shops along Denman Street. Don't forget to wear your helmet! The best time to visit the park is during the summer. If you happen to be visiting Vancouver during the fall, winter or spring, be sure to wear a rain jacket and pack a small umbrella. 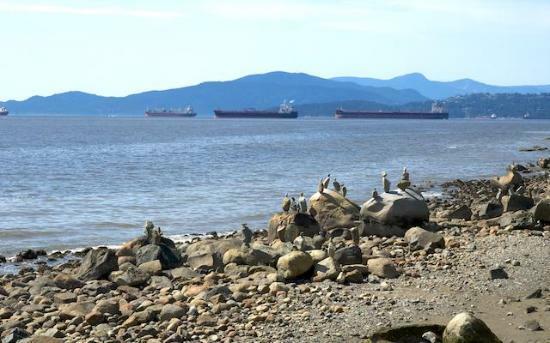 The seawall is one of city's most scenic attractions and covers 22km of Vancouver's waterfront. Whether it be walking, jogging, cycling or rollerblading, be sure to include the seawall in your travel plans. 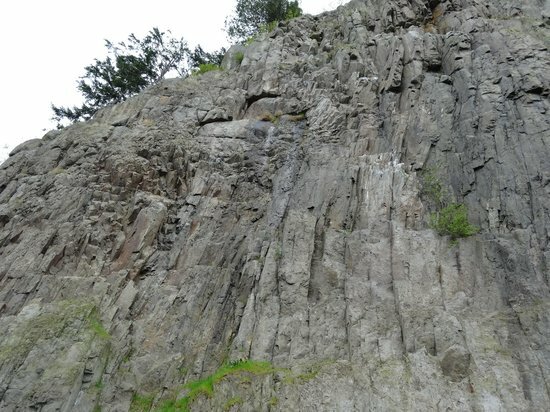 You will be mesmerized by the mountains, ocean and rock sculptures here — perfect for outdoor enthusiasts, beach goers and also a smart option for those traveling on a budget. The fastest way to cover the seawall is by bike, which takes about an hour. If you have extra time, you can walk the entire length of the seawall, which takes about 3.5 to 4 hours. Get here early: The seawall is packed during the summer so plan to get there early in the morning to avoid the crowds, especially if you plan on biking. Don't forget your camera to take pictures of Vancouver's breathtaking waterfront. 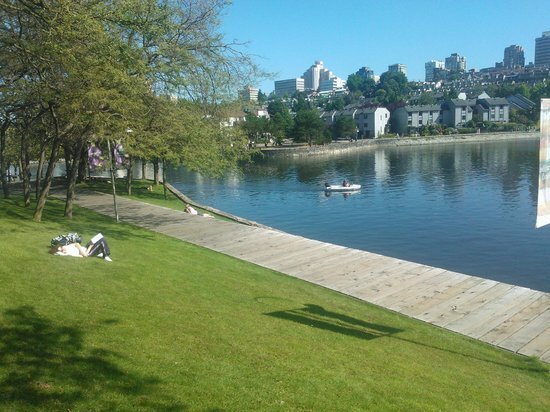 Plan a picnic: A great way to relax along the seawall is to have a picnic with your friends on a sunny day. Pack snacks and a bottle of water in your bag to stay hydrated and energized. There are a few concession stands but these have limited food choices. Most of the restaurants are located at the entrance of English Bay along Denman Street, where you can find many great local restaurants and pubs. 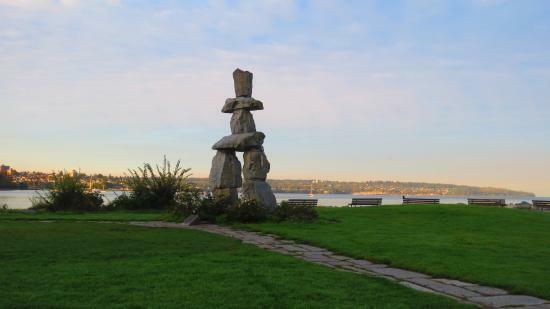 English Bay is easy to get to and conveniently located in the West End. 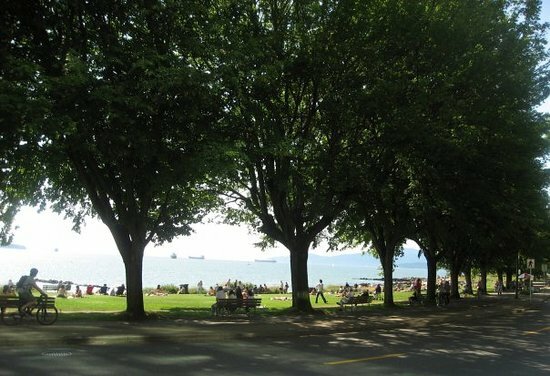 Whether it be for a light stroll or a game of beach volleyball, English Bay is a great place to relax and unwind. 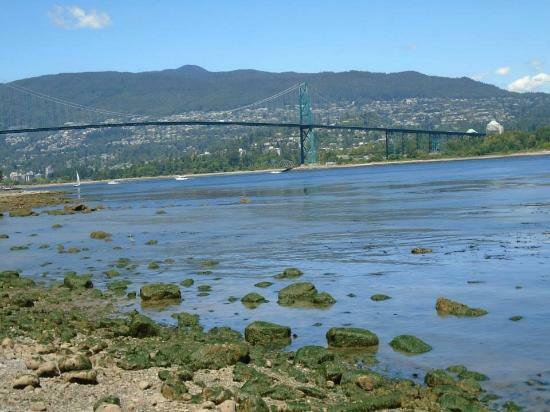 The beach is also conveniently located near restaurants and bars along Denman and Davie Street. The beach is easily accessible by bus. If you are already downtown, take the #5 or #6 bus to the Denman and Davie entrance, or you can easily walk to the beach from the center of downtown. Watch or participate in the Polar Bear Swim. This is an annual event on January 1st, where participants plunge into the freezing water in celebration of the new year. Be sure to catch the Celebration of Lights Festival if you happen to be in Vancouver the last week of July or early August. This festival is a must-see international fireworks competition, and is one of Vancouver's largest public events. 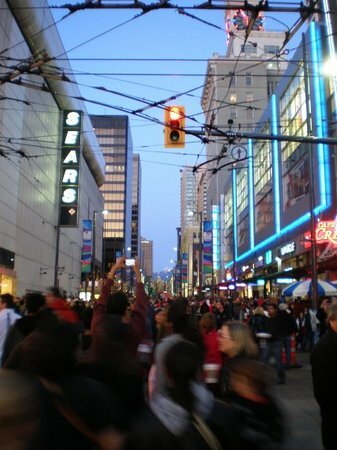 Robson Street is the place to go to if you're a shopaholic. 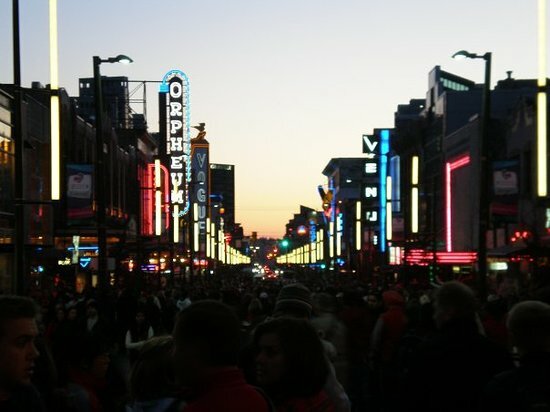 This street is mostly populated with big brand names and intersects with Burrard Street, which is home to many upscale international brands. If you're looking for something to do aside from shopping, check out the Robson Square Ice Rink. This outdoor rink is open to everyone during the winter. The best way to get to Robson Street is to take the SkyTrain to Granville Station or Vancouver City Center Station. 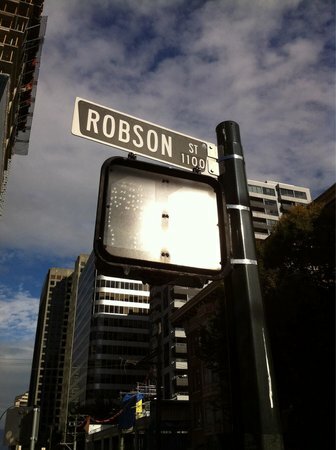 From there, it is a short five minute walk to Robson Street. You can also take the #5 bus. Looking for dinner ideas? Walk further along Robson towards Denman Street. This area is a hub for Asian cuisine with many options, including Chinese, Japanese, Korean, Thai, and Malaysian food. 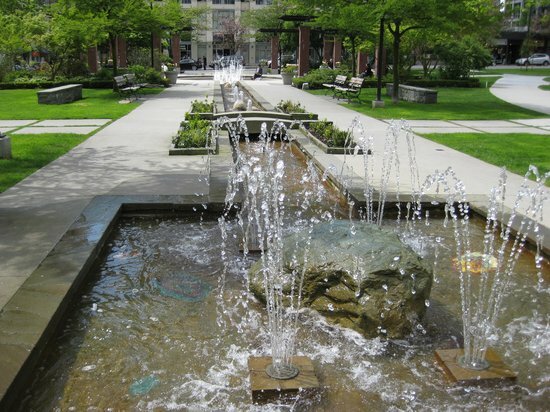 Enjoy a relaxing stroll at Canada Place, which is beautifully situated on the Burrard Inlet waterfront. 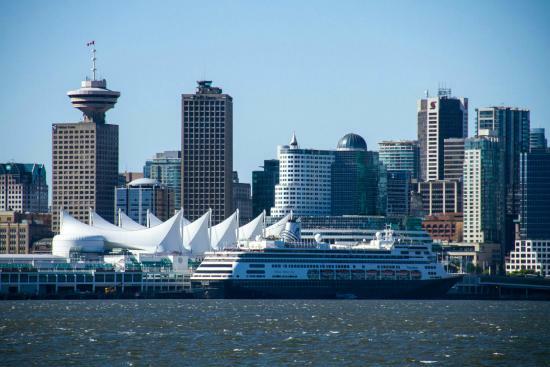 Canada Place is a major tourist attraction and is easy to get to by the SkyTrain and SeaBus. 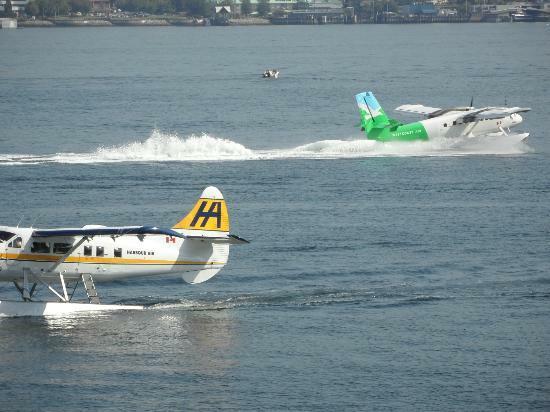 Watch cruise ships, boats, helicopters, and float planes take off while enjoying your leisurely walk. The easiest way to get to Canada Place is to take the SkyTrain to Waterfront Station. There is an exit from the train station that takes you directly to Canada Place. If you happen to be in Vancouver on Canada Day, be sure to check out the lively festivities at Canada Place. 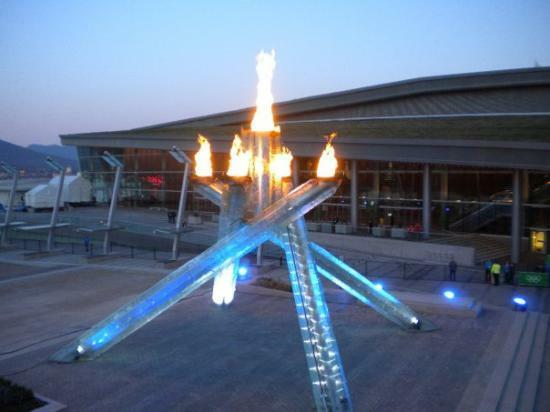 Make sure to take a picture with the Olympic Cauldron. The cauldron pillars are also lit up in blue at night, making it a spectacular landmark to visit after dinner. 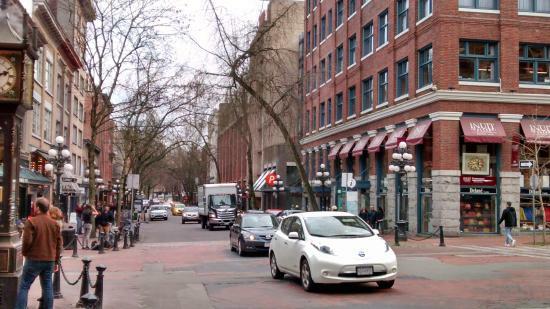 Gastown is one of Vancouver's lively historical districts and is home to many great pubs and restaurants. 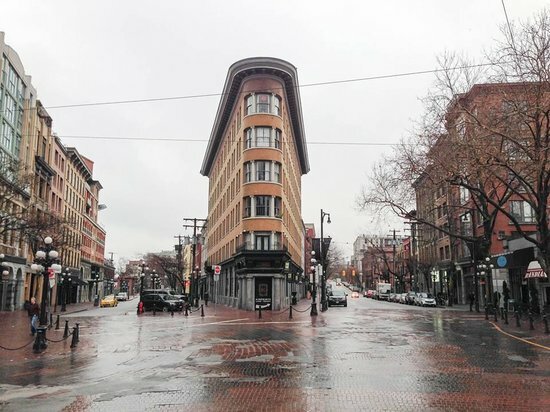 This district is vastly different from other areas in Vancouver with its heritage architecture, cobblestone roads, and historical landmarks. 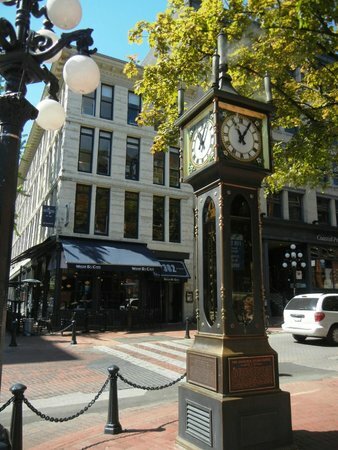 Take a photo with the Gastown Steam Clock. This steam-powered clock is a major tourist attraction in Vancouver. Gastown is home to many great local coffee shops. Treat yourself to a cup of java while you're in the neighborhood. Looking for boutique clothing stores? Gastown has many unique fashion lines that you would not find in the mall or along Robson Street. Be sure to take a look at the boutique shops while you're there. 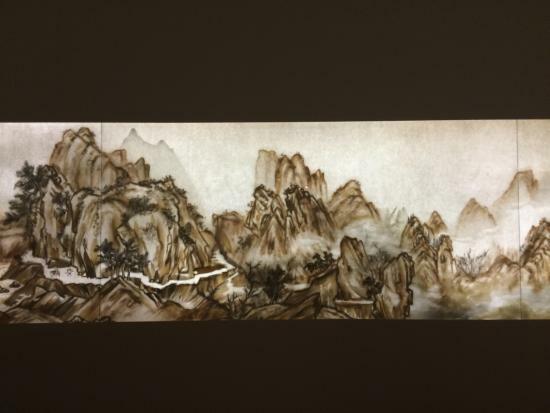 Interested in art? 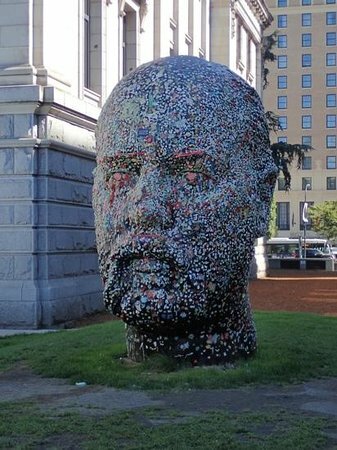 If you're looking for an alternative to the Vancouver Art Gallery, Gastown has several local art galleries for you to check out. Waterfront between Granville and Main Sts. 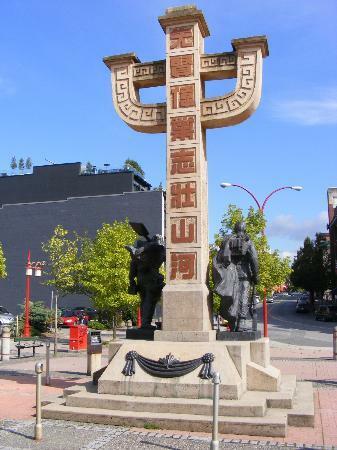 Plan an afternoon stroll around Chinatown to learn about the Chinese-Canadian heritage in Vancouver. 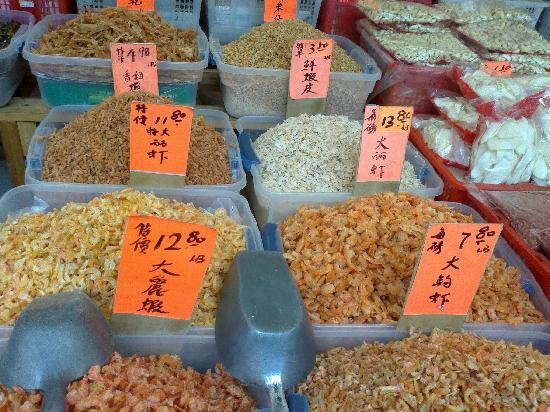 Don't forget to try the local dim sum and delicious Chinese bakeries while you're there! 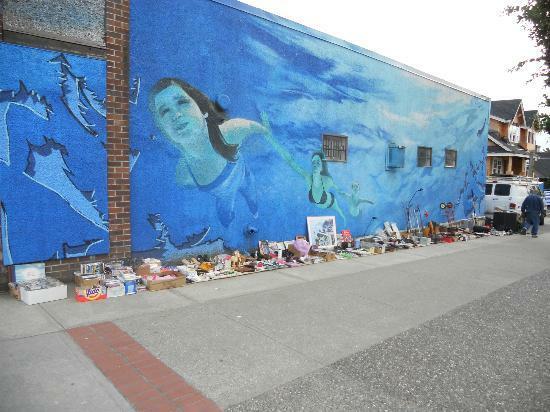 While this neighborhood is improving, it is not the safest in Vancouver. Avoid the Hastings and Main area at night. Be sure to check out the Chinese New Year parade if you happen to be in Vancouver during that time. It is a family friendly event and filled with dance performances, music, and other festivities. 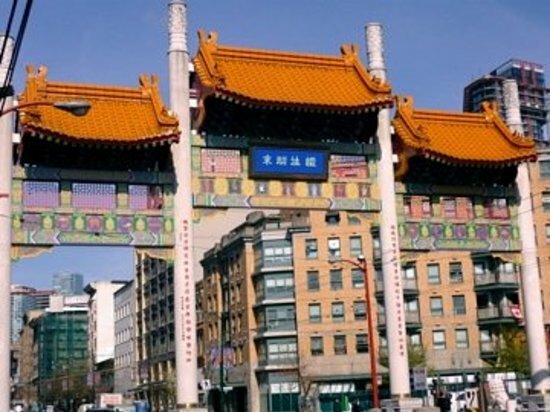 There are plenty of ways to get to Chinatown from downtown and other parts of the city. If you plan on taking the train, get off at Stadium-Chinatown station, which is a couple of blocks away from the heart of Chinatown. Which dim sum items should you order? Tasty dim sum dishes include spring dumplings ("har gow"), pork dumplings ("siu mai"), and BBQ pork buns. 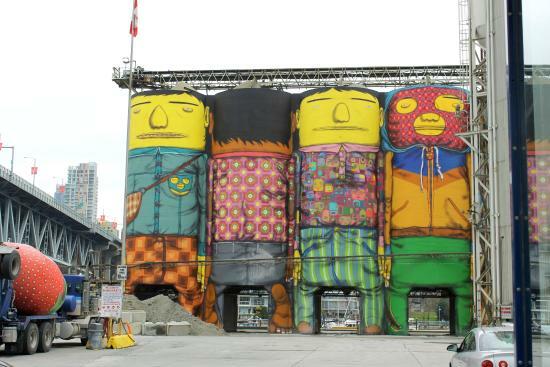 Granville Island is one of Vancouver's most popular tourist attractions. 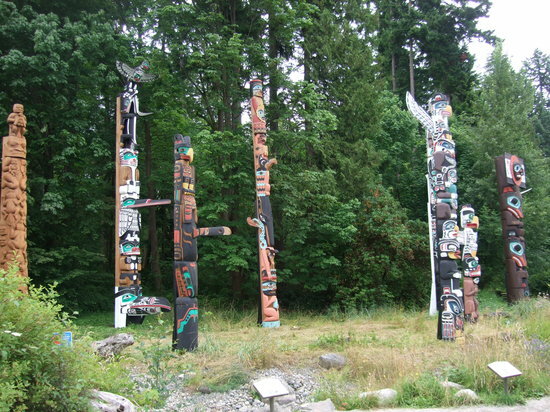 This is a great place for a light stroll after a long bike ride or kayaking trip along False Creek. 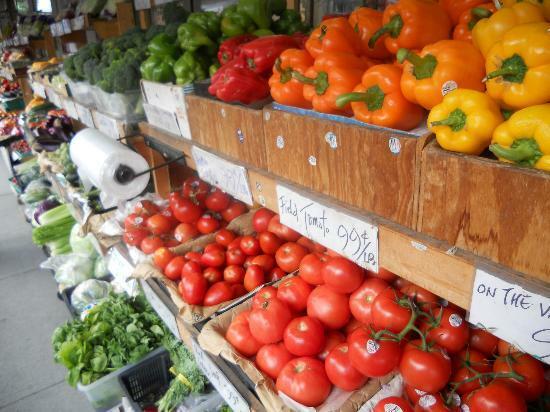 Enjoy a nice walk and explore its artisan shops, public market, and street performances. Restaurants tend to be a bit more expensive here as it is a tourist attraction. If you are on a budget, head along Broadway or West 4th Avenue for more reasonably priced meals. Parking can be hard to find during the summer and at weekends. 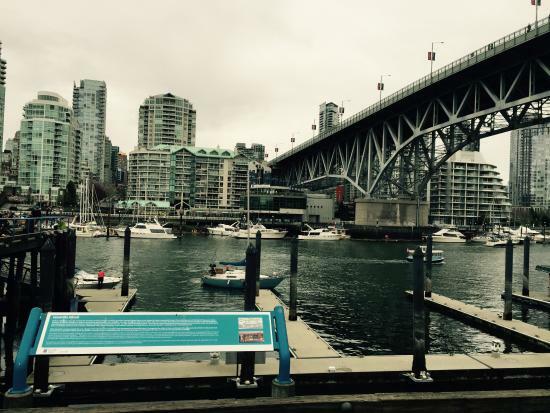 If you are coming from downtown, the easiest and fastest way to get to Granville Island is by the False Creek Ferry. The ferry leaves every few minutes from the Aquatic Center. If you are looking for evening entertainment but don't want to head downtown, check out the improv show or live music offerings on Granville Island. 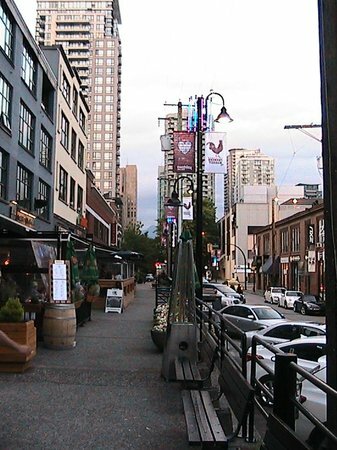 Yaletown is one of Vancouver's trendiest and most stylish neighborhoods. Once a heavily industrialized area with warehouses and railways, today this neighborhood is characterized by its combination of old and new architecture. Packed with boutique shops, spas and local restaurants, this district is the place to be for trendsetters! The most convenient way to get here is to take the Canada Line train to Yaletown-Roundhouse Station. Yaletown is a very dog friendly neighborhood. 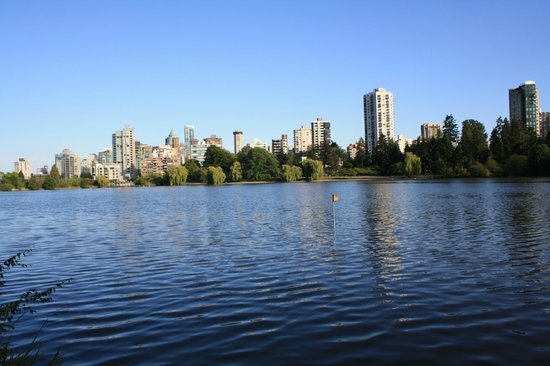 There are several nearby parks where you can walk your dog while enjoying Vancouver's scenic views. I don't recommend driving as parking is expensive and difficult to find in this neighborhood. Plus, the roads along Hamilton and Mainland are quite narrow and busy with pedestrians on the weekends. Known as Vancouver's 'hippie' neighborhood, Commercial Drive (also known as 'The Drive') is the place to go if you love coffee, art and music. This neighborhood is a hub for delicious ethnic cuisine and is home to many talented artists, writers, musicians and performers. This best way to get here is by SkyTrain, bus or bike. If you plan on taking the SkyTrain, get off at Broadway Station, which brings you directly to Commercial Drive. The #9, #99 and #20 buses also take you directly here. If you're traveling on a budget, check out the pizza places along Commercial Drive that offer a great deal on two tasty pizza slices and a soda. Try Italian food while you're here. Commercial Drive, formerly known as "Little Italy," has a vibrant Italian community and is known for its delicious Italian food. 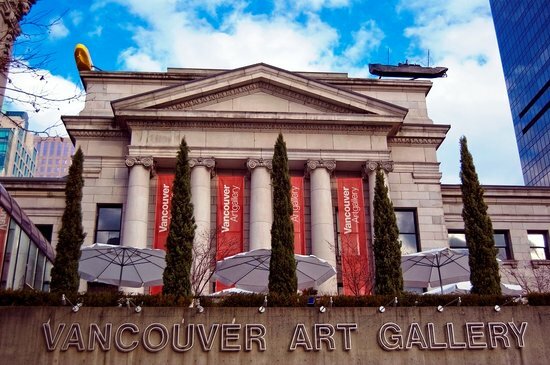 The Vancouver Art Gallery is a must-see attraction for art lovers and history buffs. Located in Downtown Vancouver, the gallery is easily accessible by transit. Perfect for a rainy day. If you're on a budget, plan your visit to the gallery on a Tuesday between 5 and 9 pm. Admission on Tuesday evenings is by donation. No food or drinks. Be sure to finish your snacks and beverages before you enter the gallery. If you do plan to go on a Tuesday, be sure to get there early. It can get crowded as most people are coming from work.